A crystal of fluorapatite on albite cyrstals with muscovite on top of the fluorapatite from the Navegador Mine, Minas Gerais, Brazil. 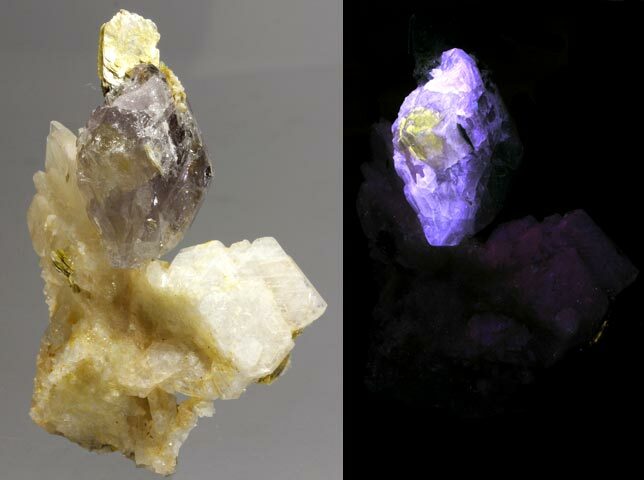 The fluorapatite fluoresces a light lavender on its face and there is a yellow fluorescing SW zoned area in the center. The albite fluoresces weak cherry red SW. The fluorapatite crystal is 1.25" wide. The piece is 2.8 oz and is 3.3 x 2.3 x 1.6 inches. A gorgeous combination with rare lavender fluorescing fluorapatite crystals on aldularia with small crystals of rutile from Shigar Valley, Skardu District, Baltistan, Northern Areas, Pakistan. The fluorapatite fluoresces lavender SW. It weighs 9.5 oz. and is 3.2 x 2.8 x 2.6 inches. A rare lavender fluorescing fluorapatite that has intergrown with a column of siderite from Shigar Valley, Skardu District, Baltistan, Northern Areas, Pakistan. 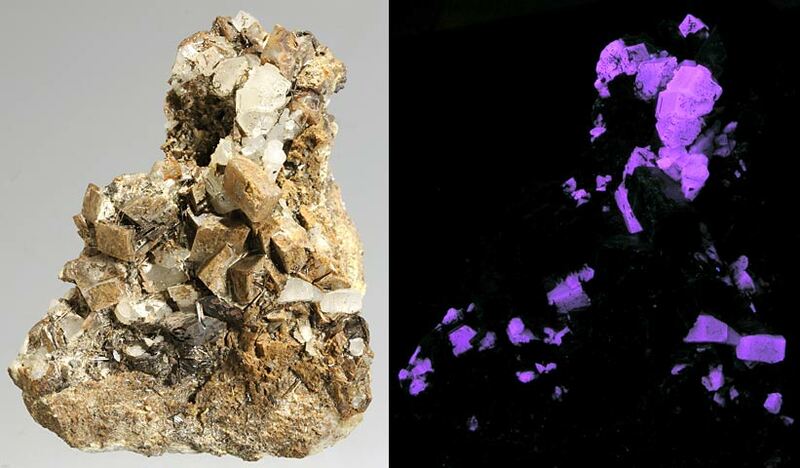 The fluorapatite fluoresces lilac SW. The piece weighs 1.1 oz. and is 2.7 x 1.2 x 0.9 inches. A beautiful yellow fluorescing fluorapatite on microcline from Dassu, Gilgit District, Pakistan. 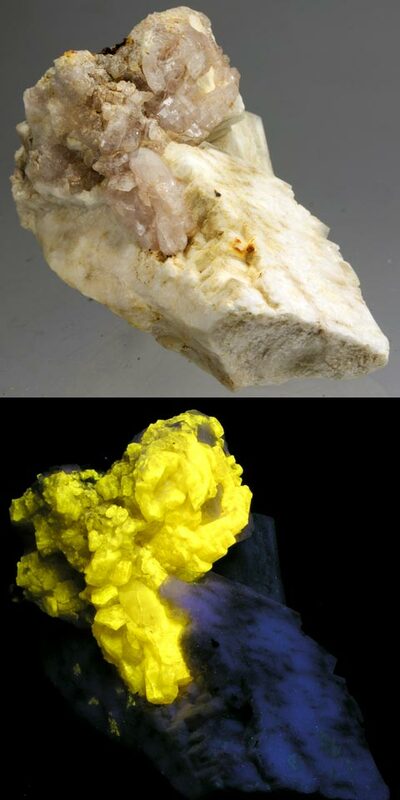 The fluorapatite fluoresces yellow SW. The piece weighs 5.5 oz. and is 3.0 x 1.9 x 1.5 inches. 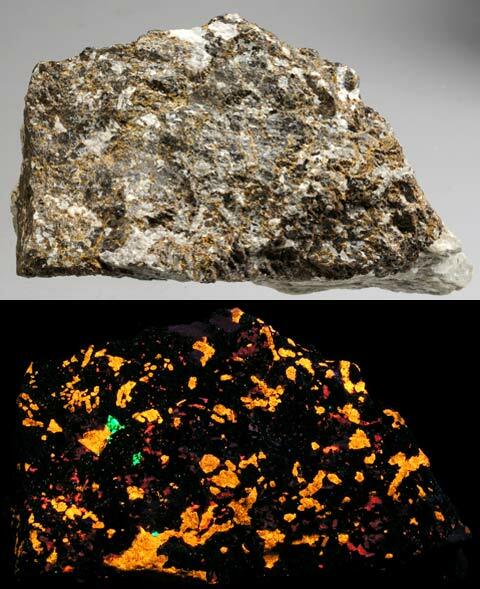 Rare johnbaumite, andradite, & hendricksite from Franklin, Sussex County, N J. Johnbaumite fluoresces orange SW. It weighs 16.0 oz. and is 3.3 x 3.3 x 3.0 inches. A great example of very brightly fluorescing fluorapatite from the Franklin mine, Sussex County, NJ. It fluoresces bright orange SW. It weighs 13.5 oz. and is 4.0 x 2.3 x 1.8 inches. Rare turneaurite with calcite from the 2007 find at the Mill site, Franklin, Sussex County, NJ. 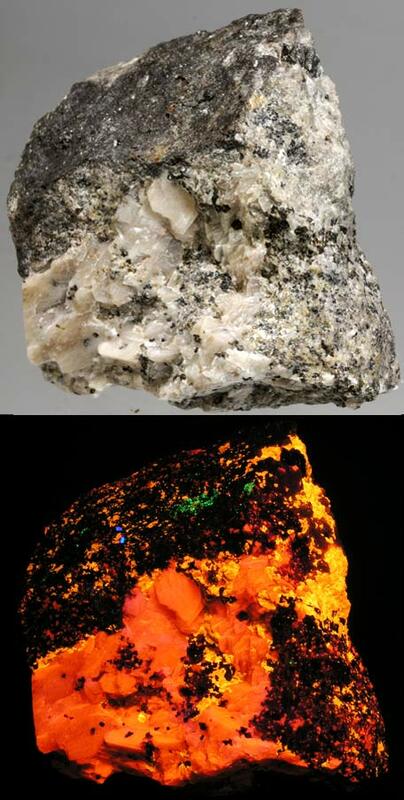 The turneaurite fluoresces bright pale orange SW and the calcite fluoresces bright red-orange. It weighs 4.4 oz. and is 2.3 x 2.0 x 0.7 inches. Turneaurite, with a beautiful crystal on top, with calcite from the Franklin mine, Franklin, Sussex County, NJ. 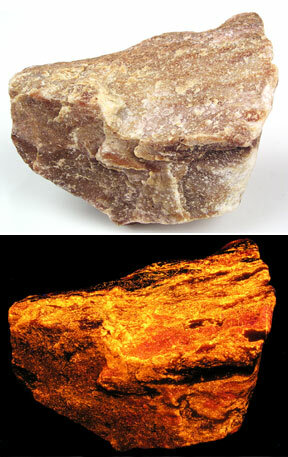 Turneaurite fluoresces bright pale orange SW and the calcite fluoresces bright red-orange. It weighs 1.3 oz. and is 1.5 x 1.3 x 0.5 inches. 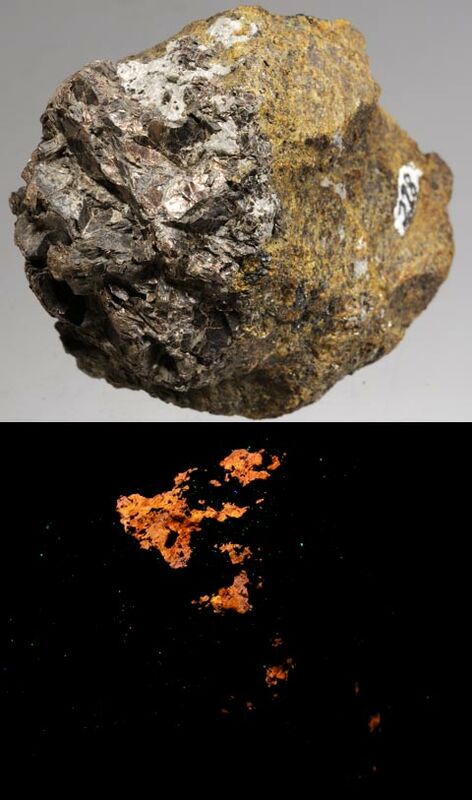 Turneaurite, from the Zinc Corp of America Mine #4, 2700 foot level, Balmat, New York. 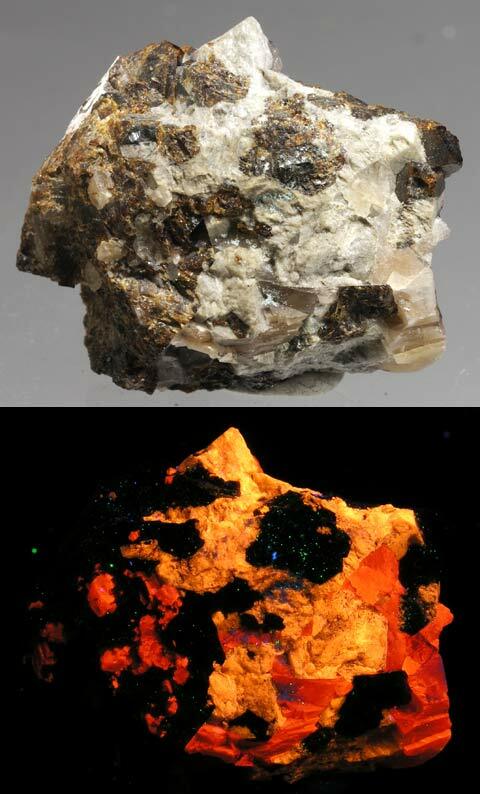 Turneaurite fluoresces bright orange SW. It weighs 3.5 oz., 1.8 x 1.2 x 1.0 inches. 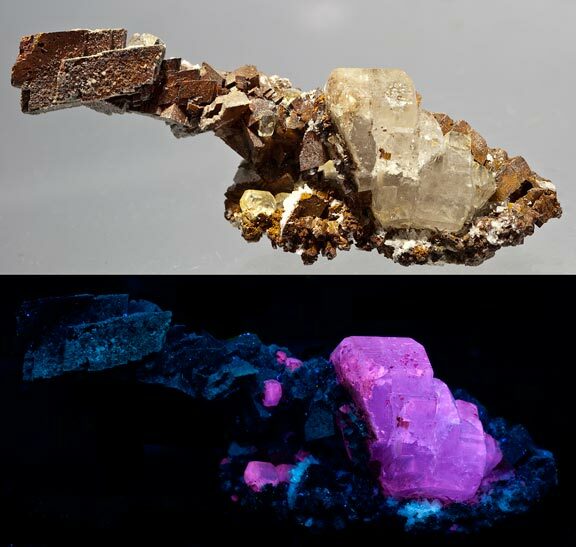 Svabite and tilasite from Langban, Varmland, Sweden. Svabite is a member of the apatite group. About 12.0 oz. and 3.5 x 2.6 x 2.2 inches.